The Ninth Summer School in Synthesis Imaging will take place from June 15 through June 22 of 2004 in Socorro, NM. The school will comprise a week of lectures on aperture synthesis theory and techniques at a level appropriate for graduate students in astrophysics. Basic lectures on synthesis imaging, and advanced lectures on more specialized techniques, will be included. Practical tutorials demonstrating data collection, calibration and imaging of both VLA and VLBA data will be given. There will be a nominal registration fee, which will cover the cost of the meeting and a copy of ASP Vol. 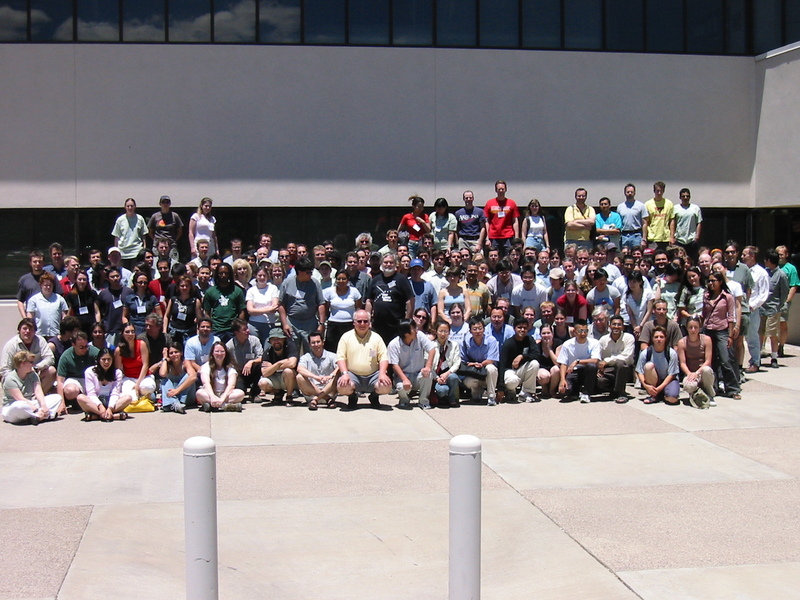 180, "Synthesis Imaging in Radio Astronomy II", from the 1998 summer school. First announcement about the meeting, and a pdf file of the poster for printing. The second announcement about the meeting contains everything you need to know about registration, accommodation, and other logistics of the Summer School. A list of people who attended the meeting. Instructions for travel and arrival in Socorro for the Summer School. Schedule of lectures and events for the meeting. School photo of people taken on the day of the data reduction tutorials. If you have more photos you would like to contribute to the collection please send them to me! Links to pages of other photos from the School. A video of some of the lectures, kindly provided by Dusan Maletic. Powerpoint and pdf versions of the lectures presented at the School. Please send comments to Claire Chandler. Last modified 2005 October 20.